Having panic attacks, suffering PTSD, being anxious when we don't feel like being anxious, well, that hardly makes us feel 'normal'. But you know that. What you don't know, probably, is that there is no normal and that within these uncomfortable "phenomena" that overtake us lies the truth about what we need to DO to be comfortable with ourselves. We, basically, have to get creative or succumb to misery playing out over and over again. Society, so divorced from nature, gives us plenty to be anxious about, any day, any time, any year, but it sort of goes on under the radar, so to speak. We can't really identify the malaise as it can't be measured, quantified, or purchased in a store. So we go around feeling hurt, anxious, worrying, fretting, panicking. I was raised in a totally dysfunctional family "system". You can call it the "picture perfect" family of the 1950's, right out of Central Casting. My mom looked like a movie star and won beauty contests; my dad looked like a movie star and drank like a fish and picked up other women in bars. It was an awful burden to carry as a child. Then when I was ten, while (probably) he was blacked out, he killed my mother and committed suicide. In my teens I was placed in a therapeutic group home to have constant "monitoring" as living with my father's parents for five years after the catastrophic loss was no picnic and the panic attacks had started in earnest. All that secret keeping, isolation and denial didn't really help me "thrive" and people's standards as to what I should "achieve"were ridiculously high, considering the circumstances. I was living AS IF everyone would disappear at any moment, AS IF I must tell everyone everything I felt or thought about them as they just MIGHT die tomorrow, but I could not recognize this unusual, "non-normal" way of coping. Then I became a victim of the "shame spiral" as I desperately tried to stay normal at all costs. Cost me it did. Somewhere in all the shuffle I lost the real ME. I had split, but was not schizophrenic and I stayed that way until I had a child (a love replacement) when I was 26. In extending love, lots of my feelings of being different subsided. I was a great mom, but the courts didn't see it that way when the (inevitable) divorce came. They told me I could not have custody of my son because "what did I know about parenting ...?" I asked the judge, "what does ANYONE know about parenting, really…?" but this loss brought on the anxiety, panic, self rejection to the point I had to actively seek help again. That help was pretty ineffective. We're talking here about the year 1978. Since that time, society has progressed in its understanding about post traumatic stress, anxiety disorders, panic, anxiety in general .. But it is baffling choosing among the array of help on offer and it is confusing at best. This makes us feel just that bit more helpless and hopeless! It sure did that to me even back then. This feeling flies in the face of all the articles touting healthy living and spiritual growth being displayed on magazine racks these days. I picked the LEAST recommended way to "help" myself. I began in earnest to drink away my problems. I knew the bars were loaded with "depressed" people and wanted a few friends to whinge with me. But underneath, the panic was lurking, the pain had not been healed and I certainly was no closer to knowing who I was … Later, I realized I beelined for those with PTSD in every bar I ever entered. I had another son nine years later. By this time, my life was totally complex, but pregnancy forced me to stop drinking .. just long enough for some real grief to arise for the first time. I joined ALL sorts, and I mean ALL sorts, of 12-step groups. I avidly applied myself to them, too. I got a therapist, a family doctor who had been trained in PTSD, and I started "studying" every treatment approach available. So you don't get lost, this is in 1986. What I learned was that despite my problems, I had SURVIVED. I was even thriving as I set up a whole business based on supplying sufferers, therapists as well as the general public, books and other materials on PTSD, trauma, various addictions and self help. I became pretty successful at it, too, in the United Kingdom. I wasn't a "household name", but people sure knew my face from TV. The "agony aunts" wrote me with their problems. Then I found out both my sons had been sexually abused. Talk about PANIC! My old friend, Pan, was coming to visit, but I didn't "see" it that way. I began to feel shunned, outcast and rejected. I attempted to find a spiritual answer to every question that entered my life, but found that that pathway was only leading to what I label "recovery shame.". I felt GUILTY. I still hadn't "gotten it right." I had symptoms of survivor guilt, again, and was miserable, "depressed" and my PTSD compounded. 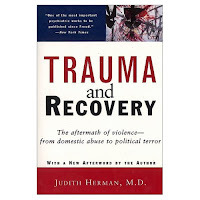 It was the book Trauma and Recovery by Judith Lewis Herman that began to set me free as I encountered an idea about evil that I could accept. I learned why those who were attempting to help me, had such a hard time of it ... those working with the anxious, the PTSD survivors and so on, get little, if any support from their colleagues. They suffer "second hand" symptoms! This is already one very long blog post .. so I am cutting to the chase of what I wanted to share with you today (and the point of power is NOW). Somewhere, in all those "symptoms" was always the answer to what ailed me. I listen to my "symptoms" very carefully each day. That way I don't feel like I am locked into a life or death struggle and I find the keys to serenity. I can in all honesty and TRUTH say I am grateful to my PTSD for what it has given, not taken, from me. I have stuck with all the symptoms my sons have exhibited and love them every day even when communication is "impossible" and "improbable" while they avail themselves of the help they have found. Men get panic disorder and PTSD too! My eldest son, Andrew, has been on mainstream TV in the US talking about PTSD, addiction and other challenges that arose after his military service in Iraq. Click here to see Andrew being interviewed by CBS News. I think he and his wife, Britta, do a bang up job explaining the need to get help and I hope you do, too. If you think my grandchildren are adorable, let me know. You must know this already, real love never dies. thank you. That is my goal, to show people you CAN make it if you really look for the LOVE .. people, interests, beautiful things, et al .. if your life! I just gave a bare bones of it all, actually, but I wanted to set a "tone" that IF we get up everyday and think about OTHERS, always doing our best whatever that is in the moment, we are "successful." We are ALL -- and I mean ALL, given such enormous gifts and talent, but we must use them in an unselfish way, not worrying every minute "what's in it for me". With that attitude you can do ANYTHING. And I do mean ANYTHING. Hugz, Jane. I needed some feedback. I think being inpiring is the HIGHEST of callings. SMILE. Ya made my day. I admire your courage in staying positive. We all have our share of hard times. We just have to stay put and hope for the best. When people like you are prepared to stand up and share your grief and pain, and also how you've handled it, it helps others to take responsibility of their own hurts. Thanks for sharing. And welcome to the blog! I look forward to reading more posts from you. I believe that if we have a strong conviction to recovery from serious ailments, we will surely overcome it. We just need to have a positive outlook at life. you have a great attitude!!! Wow! Some story. Thanks for sharing with us on the Carnival of All Substances. We'll post it on June 10. Thanks everyone! Virginia's having computer problems at the moment but she'll be back soon to catch up with you all and make her next post. Therapydoc, I'll diarise to drop by your carnival and see if there are any other stories that our readers might be interested in. Thank you for sharing your courageous journey with the Carnival of Healing. The carnival will be up at my blog shortly. I have trouble during the week deciding just what I want to "zero in on". Anxiety provoking, eh? And then there is that ole PTSD problem of going outside the box with tangents, too. Hope you can all bear with me as I get my bearings. And thanks so much for your comments.